Follow down to an area that is characterized by the two neighboring countries, separated by the River Miño, and goes through border and stately regions, marked by defensive forts and viewpoints, carpeted with “Rias Baixas” and "Vinho Verde" vineyards. On both sides of the Miño river which acts as a natural border between Galicia and Portugal you will find excellent wine producing regions, mainly using the Albariño grape variety. If you would like to add in a winery visit or two let us know and we can look into adding this into the trip. The first stop is Tui. it started off as a Roman settlement called Tude and has the typical turbulent history of many of Galicia's towns. The distant years have seen Tui at war with Portugal and the Normans as well as being a part of the Visigoth empire. Naturally Tui has a strong Celtic connection. Tui is that it has a compact historic quarter with a number of important monuments, the most significant being its castle cathedral. The city also benefits from a location that sees the old town perched on the brow of a hill with the meandering Mino river in the valley beneath. The second stop is in Valenca do Minho. The Portuguese town of Valenca sits on a hill just across the river and the two towns face each other over a valley. Both towns are connected by a nineteenth century bridge. Back in the days, this charming and colorful historical-artistic enclave was the commercial mecca to which Spaniards came to buy articles, especially textiles, very cheap. Today it continues to be a beautiful grand bazaar, which has expanded its variety of products. Back to Spain is O Rosal, exploring the art of winemaking in O Rosal Valley. The vineyards are set into places of great beauty, in a nature pampered by the mildness of the climate and the influence of sea and river. It is also here where the Atlantic receives the River Miño and where this links us to neighbouring Portugal. Between Baiona and A Guarda is Oia, where the coastline stands firm against the force of the ocean. This spectacular sight can be seen from the mountains, where wild horses graze freely. The monastery of Santa Maria la Real is something else Oia town council can boast. It is Romanesque from the 12th century and has a baroque façade put up in the 18th century, during one of a series of alterations. It has been declared a National Monument. Some petroglyphs prove the presence of horses on this mountain as far back as 5,000 years ago. In the corral, the horses are branded, broken in and have their manes trimmed before sale. Baiona is currently an important tourist enclave. This beautiful fishing village is known mainly for the castle of Monterreal, old fortress today Parador Nacional de Turismo, for its Romanesque collegiate church of S.XIII and for being the port to which the caravel La Pinta arrived after its journey, one of the three boats with which Christopher Columbus discovered America. Baiona has a lot of charm with a quaint fishing port, a number of small but appealing beaches, plus an old town that sits just behind the main seafront area. There are also many small beaches along the coastline within close proximity to Baiona. You will stop at the medieval pilgrimage village of Tui, dominated by its Cathedral. 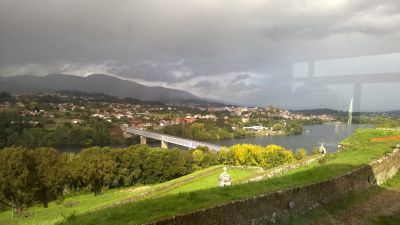 Then crossing into Portugal to visit the fort of Valença do Minho, a bordering town of historical-artistic interest as well as a gran bazaar. Also during our day we will stop at the vantage point on Monte de Santa Tegra also features one of Galicia’s best-preserved and most spectacular “castros” (Celtic Hill-fort fortified settlements). Other stops of interest on the tour are Oia and Baiona “La Real”, which, apart from its old town and fort converted into a Parador historic hotel, it is one of Galicia’s most prestigious yachting marinas.Oia is famous for its Monastery, Santa Maria de Oia which almost rises of of the sea, its incredible sunsets, the mountains and for its magical petroglyphs.